Monique Coleman at the UNICEF Snowflake Lighting in California. 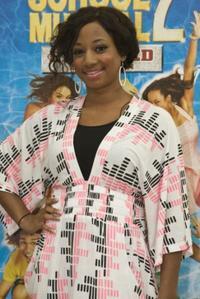 Monique Coleman at the promotional tour of High School Musical. Monique Coleman at the DVD premiere of "High School Musical 2." Monique Coleman at the 2007 Teen Choice Awards. Monique Coleman at the Do Something Awards and official pre-party of 2008 Teen Choice Awards. Lucas Grabeel and Monique Coleman at the promotional tour of High School Musical. Monique Coleman and Kenny Ortega at the "TV Moves: Magic Moments of Dance and Choreography in Television." Monique Coleman at the premiere of "The American Mall." Monique Coleman at the "TV Moves: Magic Moments of Dance and Choreography in Television." Monique Coleman and Neil Haskell at the premiere of "The American Mall." Monique Coleman at the screening of "A Raisin in the Sun." Monique Coleman at the 39th NAACP Image Awards.